Linda was born and raised in Rhode Island along the coast of Narragansett Bay where she was able to develop a sense of beauty and tranquility for her natural surroundings. This influence and her desire for self-expression led her to pursue a program of studies at the Rhode Island School of Design where she expanded her interest in artistic expression through oils and canvas. Her love for and experience with interior design and landscape architecture as well as her passion for the sea further influence Linda's sense of subject, style and color. Linda believes as an artist she must continue to learn and improve her ability to express herself and that this is a never-ending challenge. She moved to Newburyport in 1997 and has continued this pursuit. 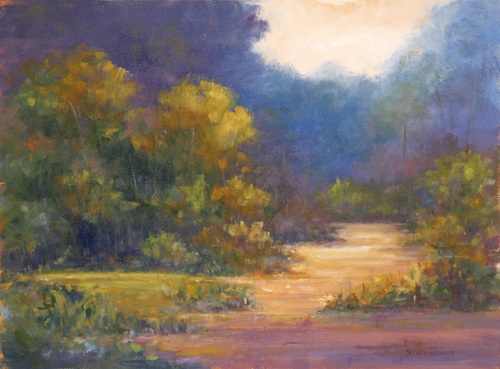 Linda is a juried member of the National Association of Women Artists - NAWA MA Chapter and the Rockport Art Association. She is also a member of the Concord Art Association, Newburyport Art Association, and an associate member of the North Shore Art Association.